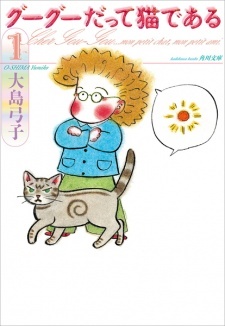 After Ooshima's cat named Sava suddenly dies, she finds it difficult to continue creating manga. However, with the help of a new kitten named Gou-Gou who shows up, she's able to get over the loss of Sava and eventually feels inspired to continue her work. When she gets the horrible news that she's been diagnosed with cancer, she's devastated at first, but soon finds some new perspective on life and death. Gou Gou datte Neko de Aru won Short Work Award in the 12th Tezuka Osamu Cultural Prize (2008). The series also received multiple Japanese live-action adaptations: a movie titled Gou Gou datte Neko de Aru (Gou Gou, The Cat) that was screened on September 6, 2008, a short drama TV series with the same title that aired from October 18 to November 8, 2014 and an drama TV series titled Gou Gou datte Neko de Aru 2: Good Good The Fortune Cat (Gou Gou, The Cat 2: Good Good The Fortune Cat) that aired since June 11, 2016.